MVC has repaired systems and circuits for a wide variety of industrial applications. Because we design electronics, we can often diagnose problems that elude others. Many of our design customers first learned about MVC when we solved a problem that 'no one' could figure out. Even though we can often repair circuits and systems without diagrams or manuals, we encourage you to make every effort to obtain the service manual and/or schematic diagrams for your circuit/system before calling us. It will save us both time, and will save you money. On site service calls are by appointment. Click on a picture for more information on a few notable repairs. 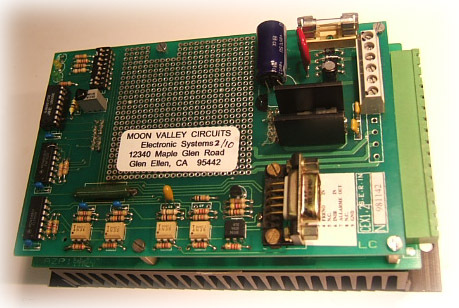 © Copyright 2006 by Moon Valley Circuits. All rights reserved. No part of this site can be reproduced in any form or by any means, photocopying, mechanical, electronic, or otherwise, without the prior written consent of Moon Valley Circuits.